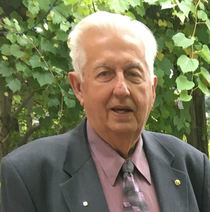 Obituary for Stanley Charles Kaminski | Westlock Funeral Home & Crematorium Ltd.
On January 31, 2019, Stan Kaminski of Edmonton, formerly of Thorhild, passed away peacefully at the age of 82, with his family by his side. Stan is lovingly remembered by his companion Alice Graham; daughter Carol (Alan ) Kassian; son Terry; grandchildren Sarah (Brad), Max, Hanna, Nora and Cole; brother Frank (Dianne); sisters-in-law Agnes Gondz & Sharon Babiak; brother-in-law Alan (Donna) Babiak; numerous nieces, nephews, aunts, cousins; as well as the Yachimec and Toronchuk extended families. Stan was pre-deceased by his wife Anne, granddaughter Becky, companion Alice Toronchuk, father Joe, mother and stepfather Josephine and Mike Gondz, brother John Gondz, brother-in-law Nick Babiak , and in-laws Sam and Mary Babiak. Stan loved life and considered each day a blessing. He always looked at the glass as half full. Stan embraced the challenges of life – growing up in the Depression years, working at numerous jobs, finding love, raising a family, making friends, and serving whatever community he lived in. He epitomized the phrase, “Live, Laugh and Love”. Special Thanks to the entire Unit 42 medical and nursing team at the Grey Nuns Hospital for your care and compassion during Stan’s final days. A Funeral Service for Stan will be held on Monday, February 11, 2019 at 10:00 AM at the Thorhild Community Centre in Thorhild, Alberta with Fr. Michael Maranchuk officiating. Interment will follow at Evergreen Memorial Gardens; 16102 Fort Road NW Edmonton, AB. In lieu of flowers, donations are gratefully accepted for the St. Peter & St. Paul Orthodox Building Fund or STARS. c/o 10004 - 105 Street, Westlock, AB T7P 1V2.